NEWARK, N.J., Nov. 18, 2014 – United Airlines and OTG Management have unveiled a collaboration of chefs and designers, along with leading-edge electronic payment technology, that will create an unmatched travel experience at the airline’s hub at Newark Liberty International Airport. In September, the two companies announced that United had selected OTG to transform the shopping and dining experience in Terminal C at Newark Liberty, with a $120 million project funded by OTG. Today, specifics of those plans were announced, including design renderings, chefs and restaurant concepts. 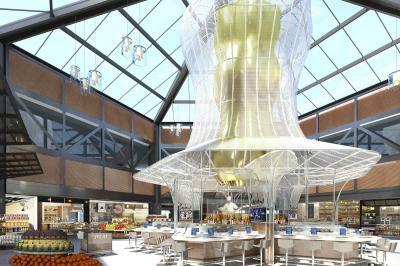 Internationally and regionally acclaimed chefs—including four with Michelin stars—are creating restaurant concepts that will make the terminal itself a destination for travelers. Saison, a classic French bistro by Alain Ducasse; Vesper Tavern, a gastropub-style tavern by Paul Liebrandt; Riviera offering French country fare by Alex Guarnaschelli; Mario Carbone lending his take on classic Italian with an Italian steakhouse; and Josh Capon’s SRF Bar, featuring a surf bar and sushi oasis with a fresh catch every day are among the inspired dining offerings. Food halls are being reinvented as a global bazaar of exciting culinary choices, with chefs hand- pulling fresh noodles at Kaedama, Shoushin Yanaura’s ramen bar; authentic Mexican street fare at Alex Stupak’s Taqa Taqueria; Nonna’s Meatball Cafe by Amanda Freitag; and hand-crafted treats at Jacques Torres’ Melange Bakery. In total, more than 55 new dining venues will provide travelers with an array of culinary choices, offering menus at all price points that emphasize fresh, locally sourced ingredients and highlighting regional and local dining experiences. OTG owns and operates all restaurants with the chef partners driving restaurant concepts and menus. Renowned architects and designers will reshape the dining and retail space of the terminal into a world-class setting that combines comfort with beautiful, free-flowing spaces, seamlessly integrating technology, craftsmanship and design. Design partners include David Rockwell of the Rockwell Group, Jun Aizaki of Crème Designs, David Mexico of David Mexico Design Group and Andrew Cohen and Jeremy Levitt of Parts and Labor Design. Nearly 60 gate areas will also be updated with custom seating and tables creating a lounge-like atmosphere. And, as in the restaurants, travelers can use iPads throughout the gate areas to track their flights in real time and order food, beverages and other amenities via a visual menu available in 20 different languages, with orders delivered to customers’ seats within 15 minutes. Additionally, travelers will not have to search for a power outlet, with over 10,000 outlets and USB interfaces accompanying the redesigned terminal seating, along with complimentary Internet browsing on nearly 6,000 OTG iPads. Art will play another key role in the revitalization of the terminal. Local artists’ works will be on display in the gate areas, as well as the main atrium that welcomes travelers as they come through security. In an industry first, United MileagePlus members will be able to use award miles to purchase dining and retail amenities at Newark Liberty Terminal C restaurants and stores using OTG’s unique iPad customer experience platform. This innovative technology marks the first time travelers will have the option to use mileage redemption for in-person purchases. Customers will be able to scan their boarding pass or enter their MileagePlus number on any of the almost 6,000 iPads that will be available throughout the terminal’s restaurants, bars and gate areas when the project is complete. The iPad will display the customer’s up-to-date flight information and offer dining or beverage options in up to 20 different languages. The cost of the items will be displayed in both dollars and miles, and at check out, MileagePlus members will have the option to pay with award miles, offering a seamless experience for the savvy traveler. With this integration, United and OTG are reimagining the airport experience at Newark Liberty’s Terminal C through elevated dining, design and technology. With the redesign already underway at Terminal C, more than 45 of the new restaurants and retail markets will open over the next seven weeks in a transition program. Offering a taste of what’s to come, menus will highlight the chef-curated dishes and customers will be able to experience the new technology with an initial 1,000 iPads. The full experience is expected to be phased in over the next 18 months, with the first permanent installations debuting in the summer of 2015. A complete list of chefs and restaurant concepts, along with design renderings are available here. United and United Express offer more flights and more seats from the New York area to more cities around the world than any other airline. United and United Express offer nearly 500 daily departures from the three major New York-area airports to more than 150 destinations – the most in North America, the most across the Atlantic, the most across the Pacific and the most to and from Latin America. United also offers the most flat-bed seats and extra-legroom economy-class seating from the New York area. The airline offers frequent daily service from the New York-area airports to top business travel markets including Boston, Chicago, Houston, Los Angeles and San Francisco. United Airlines and United Express operate an average of 5,100 flights a day to 374 airports across six continents. In 2013, United and United Express operated nearly two million flights carrying 139 million customers. With U.S. mainland hubs in Chicago, Denver, Houston, Los Angeles, New York/Newark, San Francisco and Washington, D.C., United operates more than 700 mainline aircraft. This year, the airline is taking delivery of 35 new Boeing aircraft, including the 787-9 as the North American launch customer, and is welcoming 32 new Embraer 175 aircraft to United Express. The airline is a founding member of Star Alliance, which provides service to 192 countries via 27 member airlines. More than 85,000 United employees reside in every U.S. state and in countries around the world. For more information, visit united.com, follow @United on Twitter or connect on Facebook. The common stock of United’s parent, United Continental Holdings, Inc., is traded on the NYSE under the symbol UAL. OTG is an award-winning company, elevating the airport experience with enhanced dining, design and technology in more than 200 restaurants and retail concepts in 11 airports across North America. OTG has been recognized throughout the industry for its exceptional customer focus and groundbreaking innovation. In 2014, it ranked among the World's 50 Most Innovative Companies in Fast Company Magazine.